← In a Vase on Monday. January Jewels. Of course any January list has to start with a deep curtsey to the queen of the garden, Daphne bholua ‘Jacqueline Postill’ standing in regal splendour by my front door. She can grow to be 12 ft tall and mine is already getting there. She is semi- evergreen although in very cold weather the leaves drop. And she is robed in glorious pink from top to bottom. This daphne is reputed to be somewhat tender but as it survived the Beast from The East last year I think it is pretty robust. After all it comes from high altitude in the Himalayas. The scent is incredibly sweet and delicious. If you have nothing else in your winter garden, I should find space for one of these showstoppers, preferably by your front door. Daphne odora is pretty too although not in the same league as glorious Jacqueline. 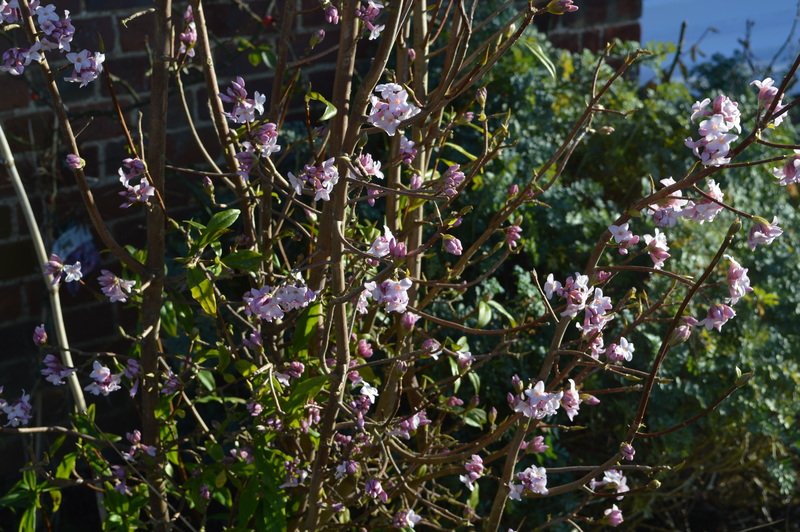 It is slightly tender but the gold edged form, Daphne odora ‘Aureomarginata’ is hardier. It forms a rounded bush and has glossy evergreen leaves. The flowers are just as fragrant but much sparser. The other star of the winter garden is undoubtedly the Witch Hazel. Cathy at Rambling in the Garden is totally under their spell and has more than anyone I know. And I can understand her need to keep on adding just one more because they come in such a beautiful colours. I have eight and still counting and it really isn’t enough, I want a grove of them. They don’t all bloom at the same time so the interest doesn’t come all at once. They are exquisitely beautiful with their spidery, sea anemone tufts and they are fragrant. The scent is not noticeable outside but if you pick a few sprigs for a vase they stay fresh for days and release their lovely spicy fragrance. Whatever the weather throws at them they bloom on quite unperturbed. And some of them have beautiful autumn foliage. So really what’s stopping me having my own Witch Hazel grove? Well the price actually, they are all grafted and very expensive. They are said to prefer an acid soil but they don’t get that here and as long as they are provided with nice compost and not allowed to dry out in summer they are fine. In my garden the reds and oranges are the first to bloom. ‘Orange Peel’ is first of all and it is also my favourite. Here is ‘Vesna’ just coming out and the rest have to wait until February. ‘Vesna’ has the best autumn foliage in my garden. I suppose so many winter flowering shrubs are fragrant to catch the attention of any pollinators brave enough to be out and about when it is so cold and inhospitable. It makes a walk through the winter garden a delicious experience. 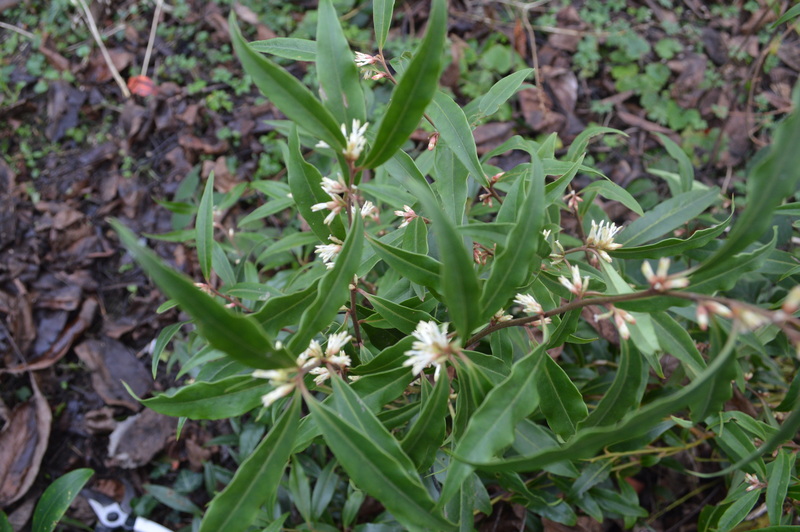 Sarcococca is gorgeously fragrant, it has a musky, honey scent and it loves a woodland position. Ideally I would love a hedge of these beauties similar to the one at Anglesey Abbey which makes your walk from the car park to the visitor’s centre such a sensory delight. But they are expensive to buy so I content myself with a few dotted about the garden. They are evergreen and bear plenty of berries, in fact the name means ‘juicy berry’ so maybe it would be worth trying to grow some from seed. 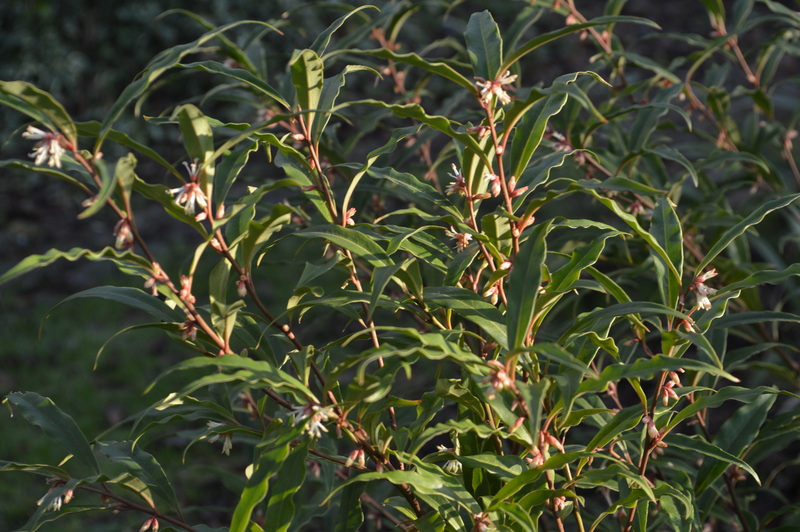 Sarcococca confusa has quite broad leaves and cream flowers. It has black berries after flowering. 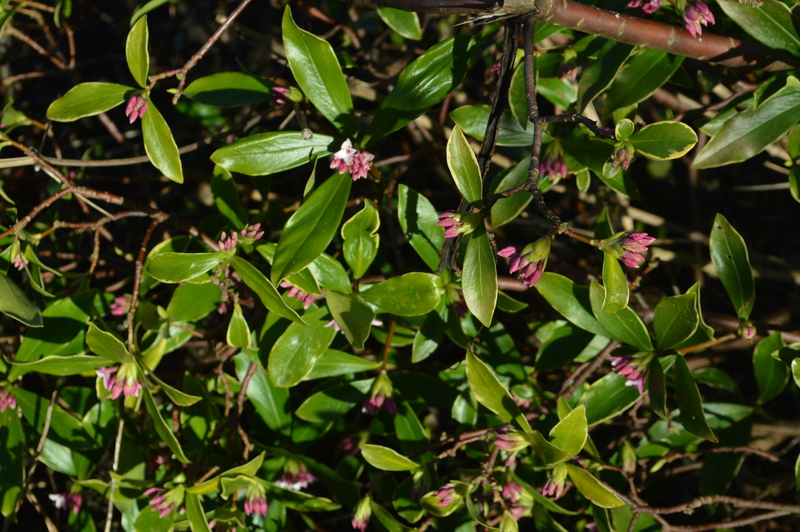 Sarcococca hookerianna var.digyna is shorter and has narrower leaves and the little flowers are tinged with pink. My latest one has purple stems. The leaves are flushed with red. 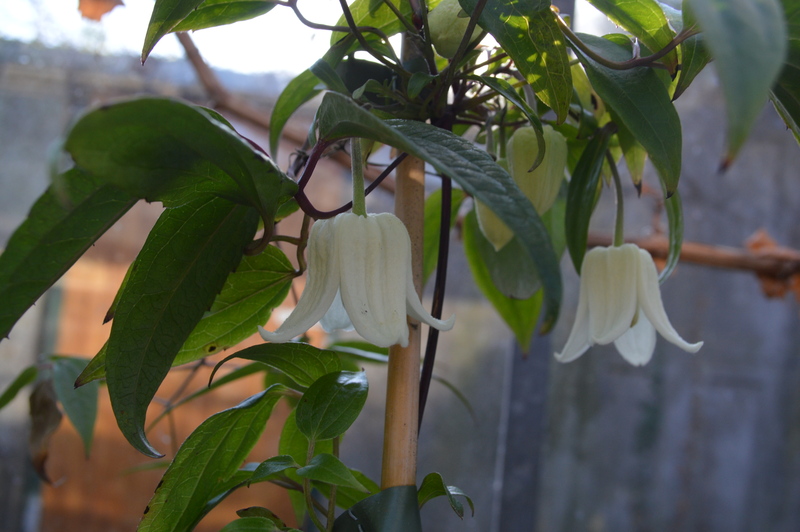 I chose lovely Clematis cirrhosa ‘Wisley Cream’ for my December favourites list. It is looking better than ever and is quite unperturbed by the freezing cold weather at the moment. But this month’s clematis is a little tender. It can take temperatures down to -5 which is about 23 fahrenheit I think. So just in case I will probably keep it in my cold greenhouse. I love its waxy white bells and evergreen foliage. I have a very special little daffodil which is usually blooming by Christmas Day or at the latest the beginning of January. This year for some reason I have only got leaves and no blooms. It is going to get very careful feeding and watering this year because the little charmer is one of the joys of the winter. It is very rare and special, it is called Narcissus minor ‘Cedric Morris’ and you can read about its history here. I popped down to my green-fingered friend Maggie’s to take a photograph of hers so that you can see what it looks like. It is only 10 inches tall and a perfect gem. This freezing morning had all the snowdrops and hellebores drooping about on the ground looking miserable but this little chap is quite unconcerned. 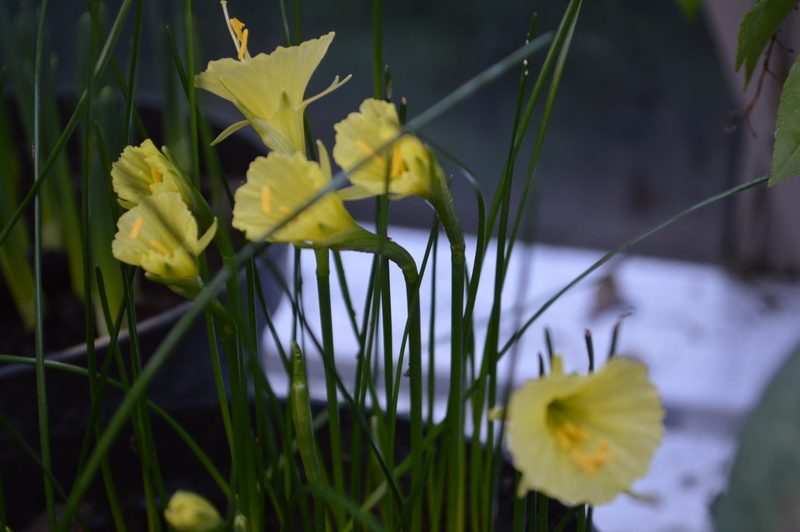 But I have a little narcissus in the greenhouse to enjoy. I am not sure how hardy it is but anyway, I am going to keep it in a pot so that I can enjoy in comfort. Outside its delicate beauty would might get spoiled. 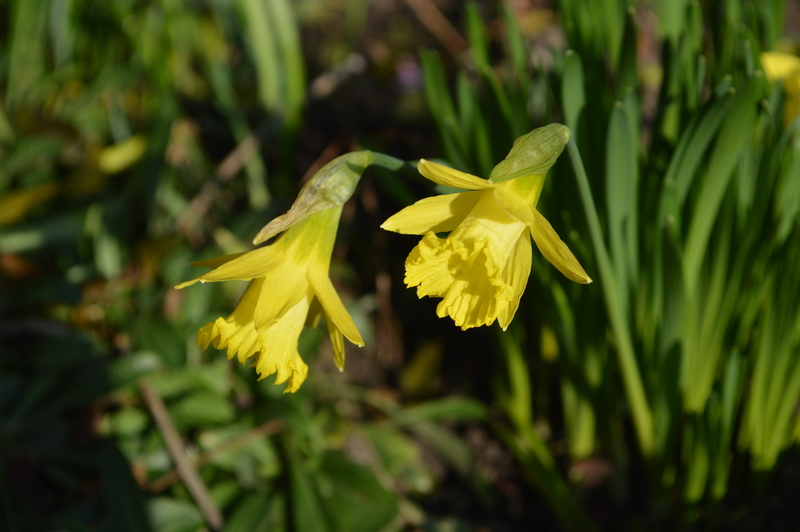 It is the hoop petticoat Narcissus romieuxi ‘Julia Jane’. Gradually the carpets of winter aconites Eranthis hyemalis are spreading. They start off as perfectly round yellow buttons surrounded by a green ruff. As soon as the sun comes out they open out into buttercups. Reginald Farrer complained that the colour is ‘almost dreadful, an acrid, malavolent yellow…’ Well, he was difficult to please. In fact he said he retired into his orchid house to kill woodlice in January. Not only did Farrer complain about winter aconites but he said snowdrops gave him chilblains. He said: ‘Was there ever such an icy, inhuman, bloodless flower, crystallised winter in three gleaming petals and a green flecked cup?’ Ungrateful man, with opinions like this I hope the woodlice ate all his orchids. I am going to try and be restrained and just show just a few of my darlings. I know a lot of you think a snowdrop is a snowdrop but you are quite wrong there. We are perfectly poised in the snowdrop season with plenty to enjoy now and plenty still to come. Most of them are looking too sad and frozen to be photographed today so here are just a few. The rest will perk up when the freeze comes to an end. 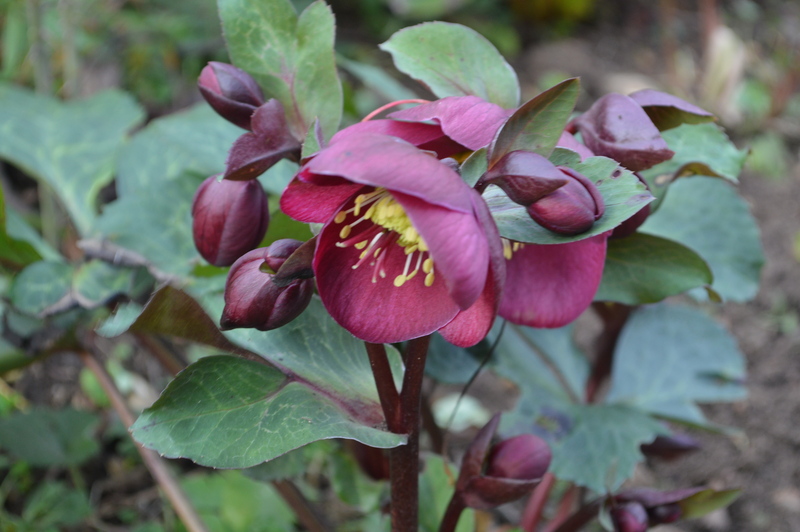 I admit I am a hellebore bore, well who can resist them there are so many wonderful new hybrids? 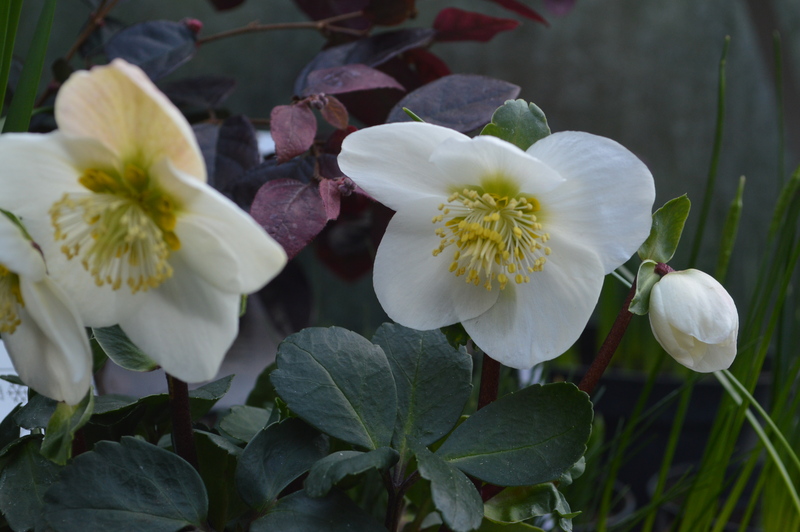 The first to flower is usually the Christmas rose, Helleborus niger but I prefer to keep it in a pot in the greenhouse because outside it often gets splashed with dirt and eaten by slugs. 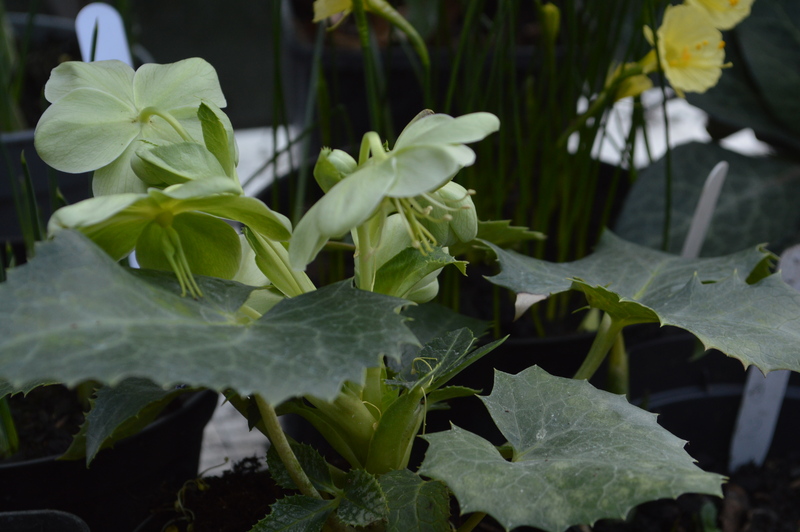 I keep Helleborus lividus in the greenhouse too because it is not quite hardy as it comes from Majorca. 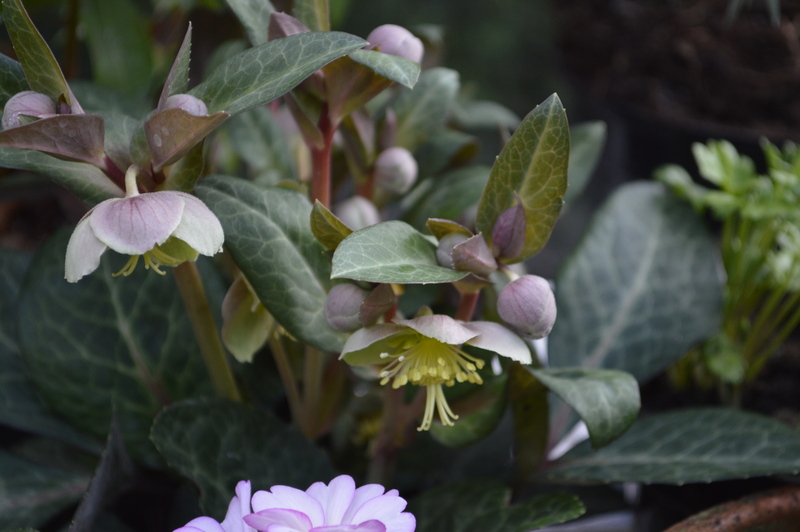 The wonderful Helleborus x eriicsmithii hybrids are a cross between Helleborus niger and Helleborus lividus, they are all gorgeous with lovely foliage and masses of flowers. And then we have the Rodney Davey Marbled Leaf Group, a lot of them with girls’ names. I love ‘Penny’s Pink’ but ‘Anna’s Red’ is a particular favourite. And not forgetting ‘Molly’s White’. 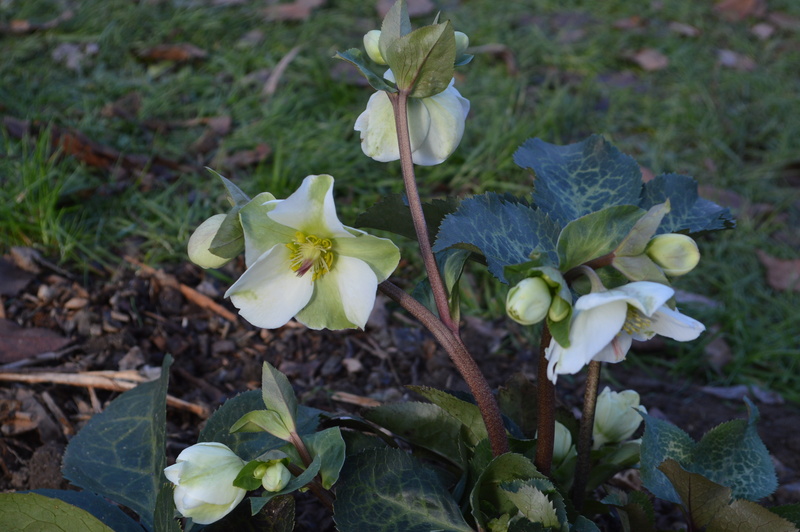 All the Lenten hellebores which used to be Helleborus orientalis are now Helleborus x hybridus which makes sense as their are so many hybrids around now. I have plenty in the garden because the previous owner clearly liked them and they have seeded around very happily. The only care they have is a bit of bonemeal in March. In early January I cut off all the leaves to display them better and to prevent the spread of blackspot. Tougher leaves like those on the Corsican hellebore, Helleborus argutifolius don’t seem to get this though and their leaves are part of the attraction. 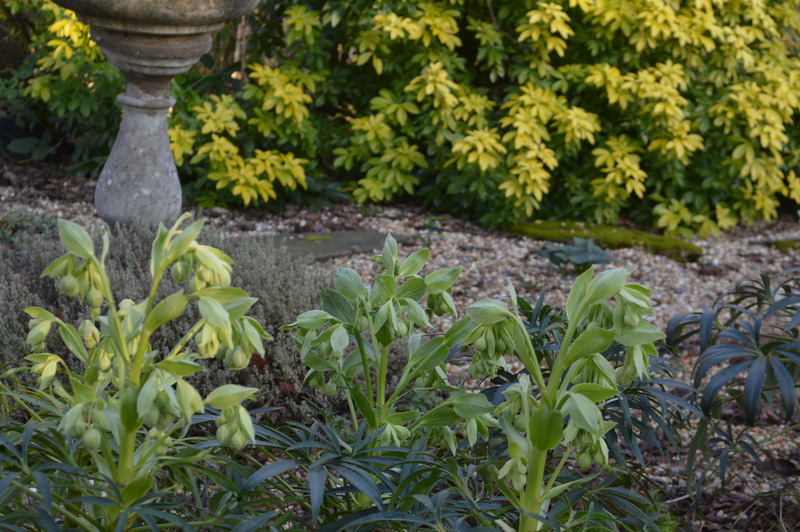 Another hellebore with apple green flowers is the native Helleborus foetidus which is short- lived but it seeds around with abandon. 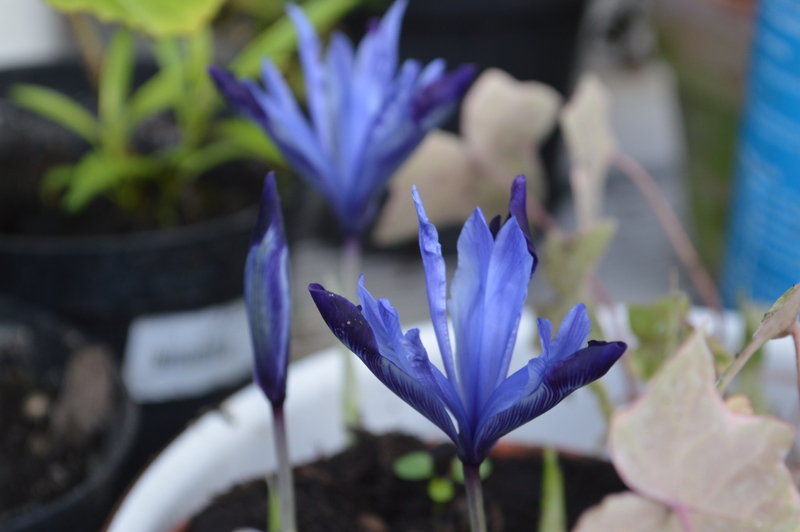 The little irises which are a joy in February will be featured next month but I couldn’t resist adding one which I have in bloom in the greenhouse right now. For my last January flower I am going into the house. My father grew orchids and had a specially designed orchid house where he kept them. Mine have to do with window sills. But the north facing kitchen window sill suits them very well, although my resident chef complains that they are in the way. Still, that is one of the penalties of living with a plantaholic. The Moth orchids, Phalaenopsis are the easiest and very cheap to buy now that they are micropropagated. They bloom for weeks in the summer and then rest for a while and by January they are off again, one almost gets tired of them because they are in bloom so long. The dark Cambria orchid is rather more refined and sophisticated. I have two slipper orchids, Cypripedium and they just bloom once a year in winter, they look almost unreal. The pansy orchid, Miltonia is more tricky and I have trouble keeping it. It has the added bonus of being fragrant. The large Cymbidium is my pride and joy because this is the first time it has flowered in three years. They can be reluctant to flower every year. Mine live in the garden in the summer and when they are not in bloom in winter they have to stay in the greenhouse where they take up far too much room. The main pest of these orchids is scale insect although I have found miltonias susceptible to mealy bug. I would love it if you would share whatever you are enjoying in your January garden. It doesn’t have to be ten, even one winter beauty would be lovely. 43 Responses to Top Ten January Blooms. You got hamamelis too! I was just telling someone else how we grew a few cultivars of it back in the mid 1990s, but discontinued it because it is so unpopular in our mild climate. I really do not know why it is so unpopular. It does not need a cold climate, and does quite well here. 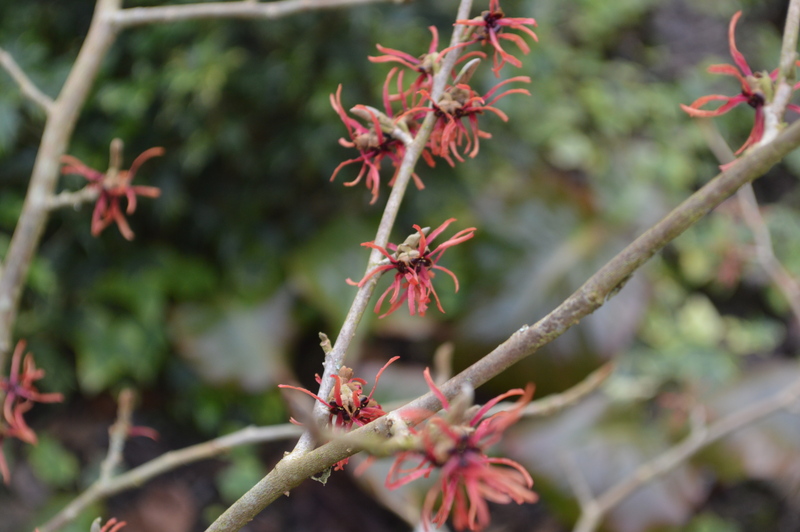 Did you grow your native Hamamelis virginiana? I believe it blooms in autumn and the blooms can be hidden by the leaves. 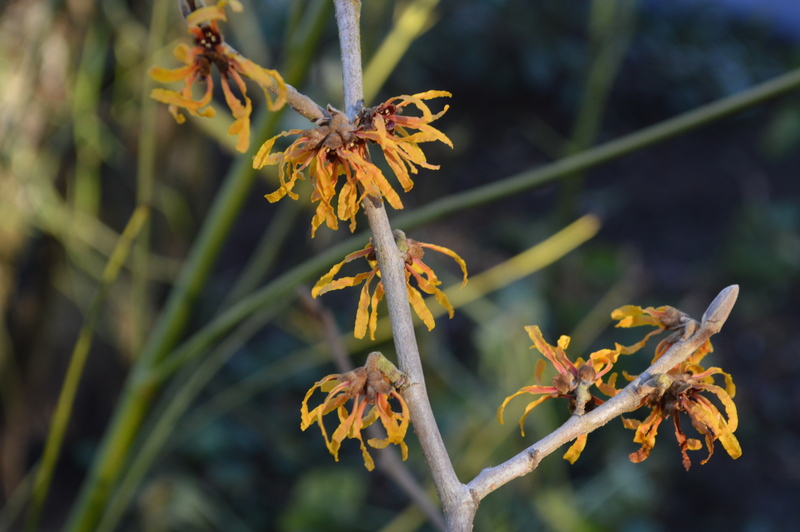 Hamamelis x media comes in irrisistible colours and flowers late winter on bear branches so the flowers really stand out and glow in the sun. I just got my first Hamamelis virginiana two years ago. It is not native here in the west. Nor is it available in nurseries. I got mine from the Arbor Day Foundation. They are tiny rooted cuttings, but I totally dig them! Our native hazel is not much to look at. It is more closely related to the hazelnut, but even huge shrubs of it only make a few tiny nuts. Eventually, I would like to see how it compares to the witch hazel (Hamamelis virginniana) for medicinal applications. Witch hazel has always been the standard, so not much is known about how our native version compares to it. That is how our native blue elderberry is. Black elderberries from the East and Europe are the standard elderberries, but can not be imported to California. I found that our natives are comparable! 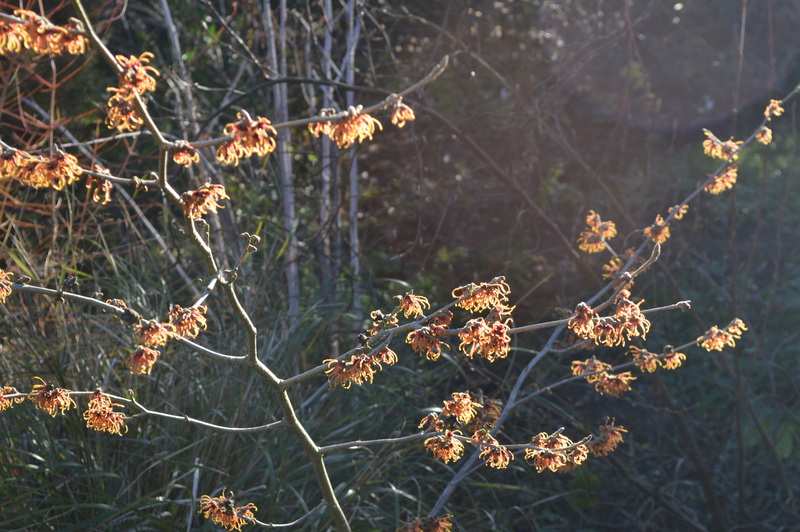 I love witch hazels but I would love to be able to grow leucadendrons like your beauties. 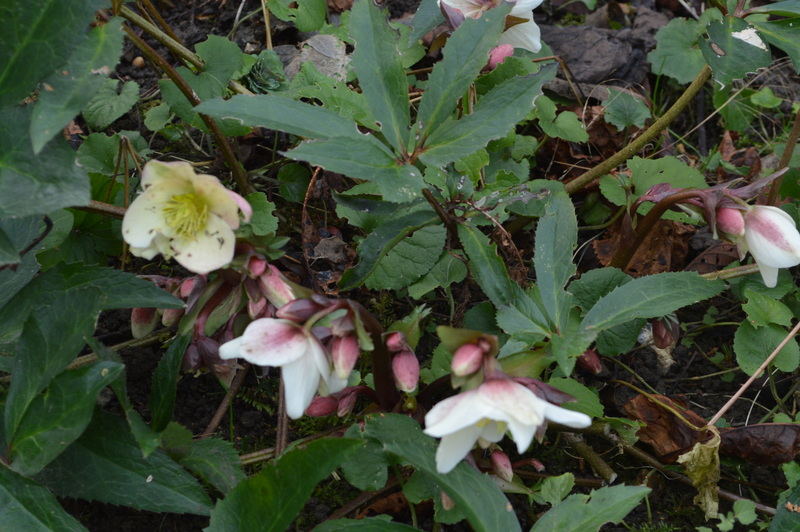 It is odd that my hellebores bloom before yours, they are particularly early this year. It’s always a joy to see all your fabulous blooms Kris. Thank you Frog. I do enjoy Farrer’s writing although sometimes he could be grumpy but his rants amuse me. What a lovely treat to visit your blog today! I love the clematis! Do they need a sunny position? 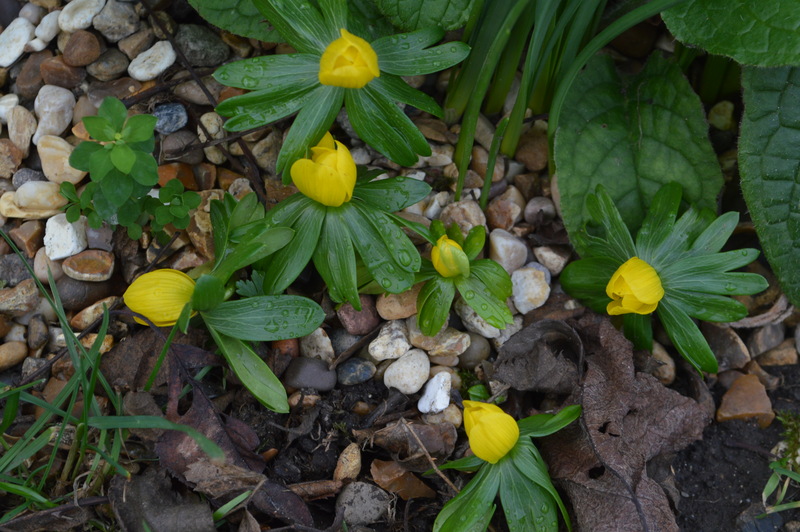 I planted aconites (and snowdrops) in the green last March, but no sign of the aconites yet. I think the snowdrops are poking through though. 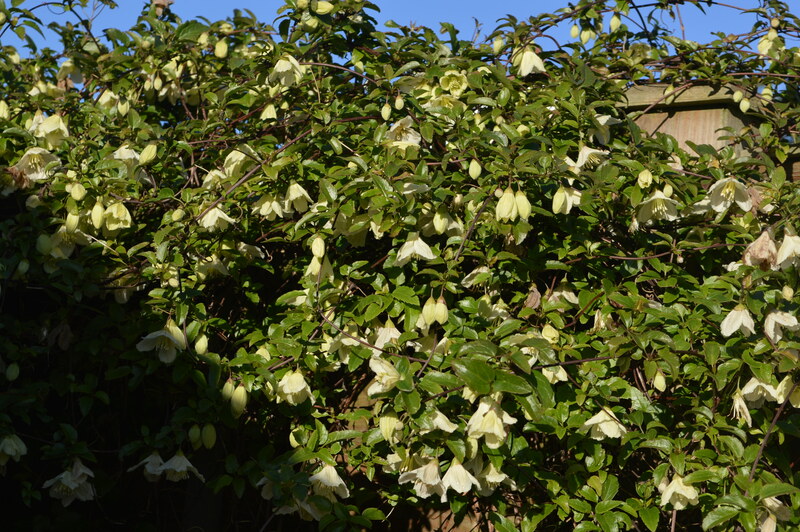 I think the clematis prefer a sunny position. Let me know if your aconites don’t appear and I will send you some. Aw, thanks Chloris. I shall let you know if anything happens. They were not in a great condition so I got them for free, so maybe that’s the reason. I really like your Julia Jane. I have never seen one like that, but of course we cannot grow them here. I love the little hoop petticoat narcissus. A friend has a tiny pure white one called ‘Nylon’ which I covet. They need the protection of the greenhouse here. What an amazing collection of winter flowers! I love all the Hamamelis, and can imagine the scent. And your Hellebores. ‘Anna’s Red’ is one of my favourites. Gosh, Reginald Farrer was a cheerful chap, wasn’t he? Who could dislike a snowdrop? I am passionate about winter flowering plants or plants for winter interest, they have a particular charm and it is good to have things to enjoy on the iciest days. I have Farrer’s book, ‘In a Yorkshire Garden’ and a love it for the depth of his knowledge, great descriptive style and for his eccentricity. Also his grumpiness makes me laugh. There is so much to see in January and it all seems delightfully early this year, a real (and very much needed) pick me up on our return from Down Under. 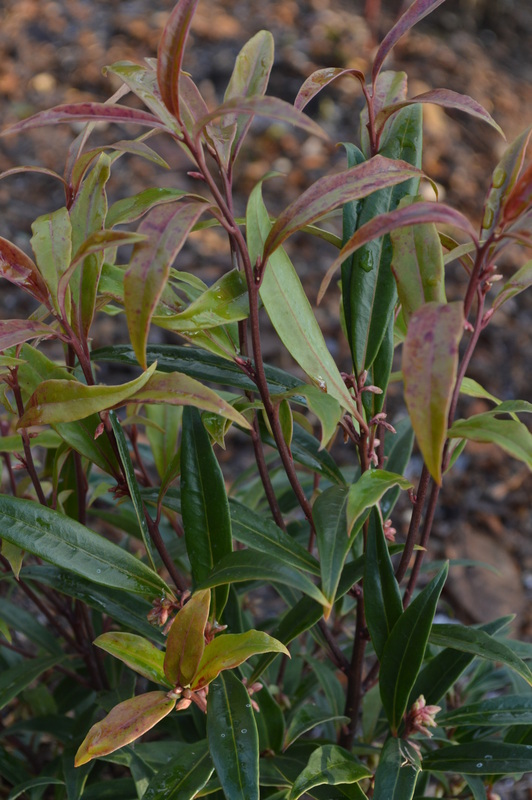 Have you tried taking Sarcococca cuttings? They strike quite well. I have about six from last year that as far as I can see are all still thriving under a net tunnel for a little extra protection. Oh you are back! What amazing trip you have had. No I haven’t tried sarcococca cuttings, thanks for the tip. Chloris that bunch is fabulous. Witch hazels, snowdrops, orchids, hellebores. Glorious! Your description about Farrer and the wood lice made me chuckle, what a beastly little man he sounds. Thank you Dorris, I am crazy about winter flowers. Farrer was an eccentric but he writes so well. I think he hated winter and it made him grumpy. I love all your fabulous winter interest inside and out! Your Hellebores and Orchids are gorgeous! Thank you Lee, most of my orchids are winter flowering which is a great advantage as I spend more time inside. Your garden must be a real joy in winter, Liz. As I said last month I really love winter flowering shrubs but they definitely don’t flower as long here as in England but that shouldn’t deter me, I really must add some more. My Lonicera fragrantissima started flowering this week – it has the best perfume of anything I grow and at last it is sending up some long stems that I can cut and use indoors. Winter flowering honeysuckle is lovely for picking. 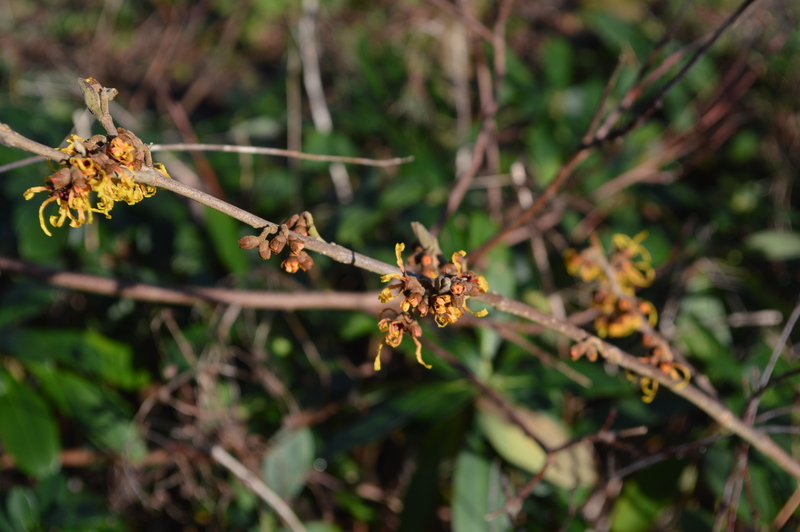 Some daphnes and witch hazels would be good and can you get Sarcococca in Italy? Yes, I have Sarcococca that had been grown from a cutting, but mine smells of cat pee rather disappointingly. 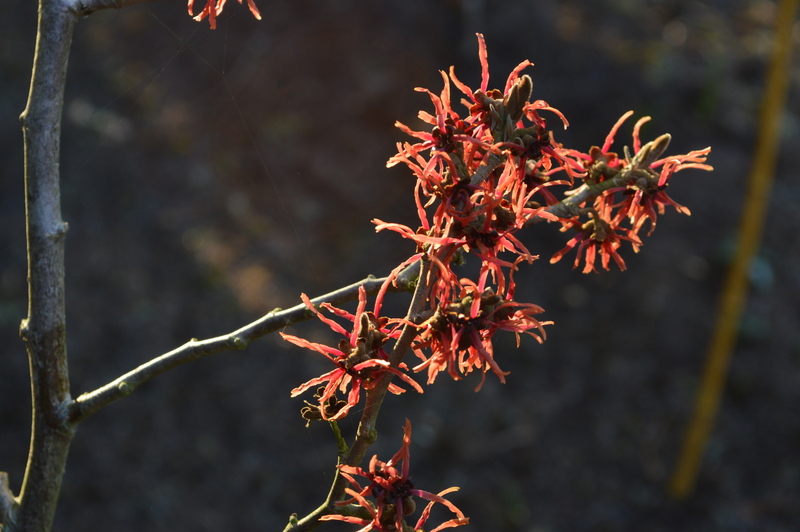 I think it’s too dry for the witch hazels. That’s odd. I find it a bit musky but with delicious honey overtones. I often wonder if we all perceive scent differently. Some women daub themselves in scent and I find it awful sitting next to them, it makes me feel sick. In extreme cases it gives me asthma. I wonder how it smells to the wearer. Presumably they like it. I think memory plays a part in how we enjoy scent too. I agree with all that. A lot of modern perfumes are made with chemically ‘identical’ ingredients but actually they’re not the same at all! You’re right too that we all perceive scent differently but I did have a Sacococca in the UK and I’m pretty sure it didn’t smell like one I have here. I bought the daphne a few years ago, expensive but worth every penny. They were difficult to get hold of a year or two ago but they are available now. I bought another one a while ago as an insurance policy. Witch hazels are expensive but clearly addictive. I am looking forward to seeing Rochester. I haven’t shown much of my orchids before but as they are all flowering together I thought that I would trot them out. Thank you for sharing your lovely January treasures. I shall adopt the bonemeal idea, wherever it came from! Gosh, January is really not too bad in your garden.I am loving all the color and scents. If it wasn’t so cold I would enjoy January, I love winter flowers. It is white with frost at the moment and like Farrer just looking at gives me chilblains. 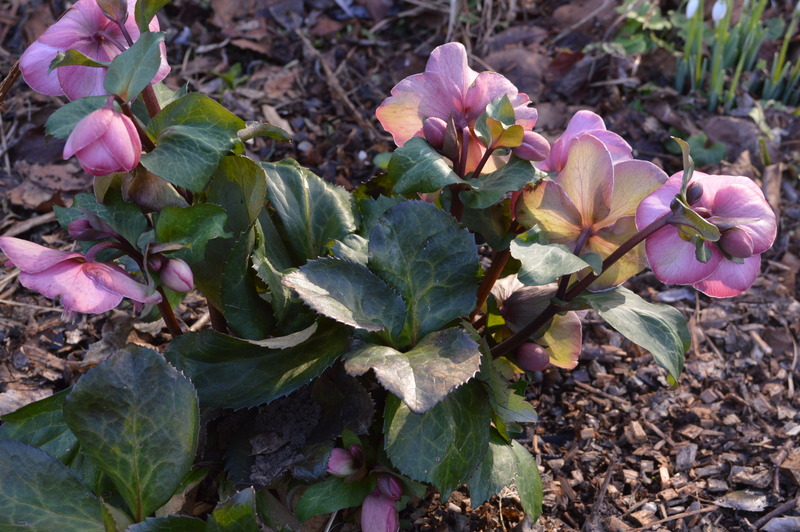 Nothing blooms here in the winter, but your post gives me hope because many of these plants–Aconites, Daffodils, Hellebores, and others–will bloom here in March. Thanks for sharing your blooms! Oh dear March, that is a long wait. Winter must be a long dismal business for you. What about coloured stems and evergreens, can you make pictures with them? Such a pleasure to see all your January blooms, and especially to imagine those with a sweet fragrance. I was tempted to put my nose up to the screen in an attempt to sniff those Daphnes! Yes, the fragrant plants are certainly the highlights in winter, do you gtow many yourself? Thank you Dina, these little winter treasures give me so much pleasure. Beautiful flowers, in my front yard, I have some of the orchids you have there and helleborus. In 2019 I’m going to plant some night blooming flowers like jasmines and several cactus plants. It must be wonderful to have both a greenhouse and an early spring. This Canadian gardener is almost green with envy. Lovely, Chloris! I like that little clematis, among several others. As always my wish list grows and grows whenever I read one of your post Chloris 🙂 I love the idea of a witch hazel grove glowing on a dark winter’s day. Eight may be short of a grove but you are getting there. Fancy Farrer belittling snowdrops in such an uncouth manner!